Now that the ley lines around Cabeswater have been woken, nothing for Ronan, Gansey, Blue, and Adam will be the same. Ronan, for one, is falling more and more deeply into his dreams, and his dreams are intruding more and more into waking life. Meanwhile, some very sinister people are looking for some of the same pieces of the Cabeswater puzzle that Gansey is after. And the adventures of the infamous Raven Boys of Aglionby continues in THE DREAM THIEVES, book two of Maggie Stiefvater's The Raven Cycle. Gansey, Ronan, Adam and Noah with Blue are still tapping ley lines in search of the mythical Welsh King and the power her holds. They're still leagues away from finding Owen Glendower however each of the boys' role in the big scheme of things is fast becoming apparent. Friendships are tested, true colors are known and Blue has yet to kiss her true love. THE DREAM THIEVES' featured Raven boy is, Ronan Lynch, and I couldn't be happier because I am a great fan of the lad. He's a bad boy, he's got a rockstar vibe going on for him, a bit of a rebel, he has an air of arrogance and nonchalance about him, a little brawler but loyal to his family and friends. Ronan's backstory is explored in depth here and how his connection to the ley lines run deep as his father is a tapper like him. Also, there's an interesting connection between Ronan and his arch enemy Kavinsky. Let's just say that both boys are manifesters and they're causing power surges on different levels. I'll leave it at that so as not to spoil y'all's reading experience. As for Gansey and Parrish, these two's friendship is evolving in a very interesting way. It seems like Gansey no longer holds the upper hand between the two as Adam is slowly coming to his own. Adam's pride is fast becoming his strength and weakness and I can only hope that he'll learn how to rein it in and use it wisely. As for Gansey, we're slowly starting to see the not-so-good parts about him. It may have something to do with his upbringing and growing up entitled and privileged which makes him appear a little superior and sometimes condescending. This is starting to rub Adam the wrong way but as Gansey is who he is, Adam will have to express more patience and exercise creativity in terms of giving Gansey constructive criticism. Like I mentioned in The Raven Boys, there's no love triangle here but rather a crush triangle. It's silly but that's usually the case with teens right? So Blue is still on the fence about Adam and Gansey because of the prophesy stating that her true love will die if she kisses him. Blue is bent on convincing herself that it's Adam she wants and not Gansey but her efforts are in vain because it's with Gansey who she has the strongest connection with. It's not yet apparent here but I'm hoping that this romantic issue will be resolved in The Raven Cycle 3. And a quick shout out to Maura, Persephone and Calla, these three are wonderful instigators and very reminiscent of the Greek Graces/Fates. Keep on stirring the pot, girls! The Gray Man. The antagonist. I found his storyline to be the most interesting. Maggie Stiefvater gave him a backstory and redeemable qualities which humanized him. His characteristics did his moniker justice because the Gray Man proved to be nothing more than an agent imprisoned by his contracts and personal and professional entanglement that connected him with the boys. It seems like he finally freed himself but his next steps are yet to be determined. We'll see if Maura can sway him on their side. 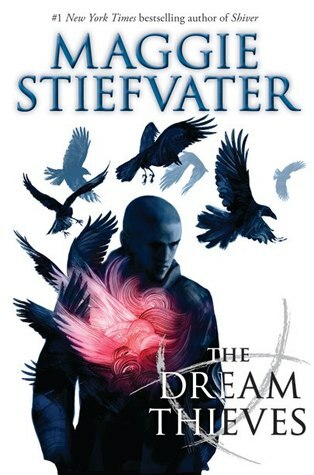 I loved THE DREAM THIEVES, it's a lot of bang for one book, many things happened, several revelations, complicated connections and lots of individual scenes with the characters, it's a little challenging to keep up. But despite its rather overwhelming qualities, THE DREAM THIEVES is a solid sequel, the progression of the plot is wonderful and I like how MStiefvater is taking her time in unfolding the series slowly. The plot as a whole is very intricate and the cast of characters and their respective storylines can be a lot to take in. I suggest you take your time in reading this one and if you have any to spare, give The Raven Boys a good skim because you might need a refresher on some parts. Book 1, The Raven Boys is on sale for a limited time at $2.99. Get your copies now, it's worth every penny. am so so glad you loved it THIS much Braine! LOL I know it fell short of your expectations, I do understand what you meant when you said that it was a little challenging to keep up with. Thanks for stopping by, Kate! I se ur YA reads are coming along. Because Im not YA reader, maybe I can live vicariously thru u...lols. great review Braine. Haha, one "shot" a week & I'm picky. I select ones I really want to read. Braine, I really need to read about these boys. Book one was on my wishlist, but after reading all of these solid reviews for book two..I am bumping them up! So glad you lived this. Get book 1 while it's on sale! As it should be. This series is really good, well planned & plotted. I have had the first book for AGES but still haven't read it. :( I'm hoping I can get to it this fall though! I'm happy to hear another great review for the second one, all the reviews have me dying to pick them up! Oooh I got an email saying she's doing a book signing near me for this one. Glad to see you liked it! Might have to go and buy the first one. Girl, the first one is on sale at Amazon, just buy book 2 for her to sign. I hope you get your copy soon! Reading this will put you in the mood to do more of your uphill trek. I'm a HUGE fan of your bookshelves/library! Thank you, Brandee! I haven't been able to get too far in this yet because I haven't had much time for reading this week (darn it! ), but when I opened to the first page of the Prologue, I was practically crying over how amazing the writing was. Ally will be thrilled that this one is so focused on Ronan because that's her Raven Boy (I'm a Gansey girl, and Melissa's for Adam. We're just missing a Noah fangirl, lol). Lovely review, Braine! Oooh! I need to fangirl with Ally then!